I've had Parenting in the Pew : Guiding Your Children into the Joy of Worship on my wishlist for awhile. Jonathan bought it for me for Christmas and I was able to read it a few weeks back. One word: Awesome. I know that people's opinions about children's church can be different and feisty. Some people are for it, some against it. Some people and churches do not invite children to sit in on the main worship service or divvy up the congregation behind a sound proof wall. There are many, many strong feelings out there about having one's children sit in the service with them. Will the children behave? Will they get anything out of the "experience" anyway? Lots of questions and I'm not here to answer any in particular. This post is a "Totally from Jonathan and Carrie's perspective" post. Nothing more, nothing less, my friends! For our part, we are of the mindset that it is the parents' responsibility to instruct their children on how to engage with the church service and behave during it. We aren't "professionals" as some might refer to a trained Sunday School teacher. No, rather, we're "just" their parents who know them best and live with them day in and day out and who know their strengths and weaknesses. (We're very pro-parental involvement around these parts.) And, of course, our children are only toddlers still and we'd rather have them focusing on us a bit more as it is. We've felt that the place for our children to be during church is in the service with us. I love Parenting in the Pew because Robbie Castleman has the same mindset as myself, but expresses the argument that parents ought to teach their children how to worship in a manner that is much more eloquent than myself. I've bookmarked so many passages in this book that it's hard to narrow down which to share. The basic idea of the book is this: parents have the God-given responsibility to train their children to love God and to worship Him. She argues that this task should not be left up to others but should be faithfully attended to by the parental figure(s). Castleman writes from the perspective of having raised two sons to sit in the pew with her and shares some of their opinions on the topic as well. (They were glad to be seated alongside her in church, for the record.) One thing I particularly noted and appreciated about the book is that it was clear she was writing as one who raised her children in a church where a Sunday School program was provided but this didn't phase her and her (preacher) husband from pursuing what they felt was right. They made it easy for their children to follow after them and there were no upsets expressed within these pages. She offers a lot of practical advice on how to train your children - not just to behave in church - but to learn how to truly worship God. "The temptation to just stay home, or at least keep the kids out of the sanctuary, are real. It's hard to pay attention to God and children at the same time. Now we are parents to a four year old who not only sits quietly and well during church - but he has learned some of the hymns we sing and prayers we pray and he is learning to worship by participating himself and that is a JOY to see! No, it didn't happen overnight. No, it certainly wasn't easy. Yes, we had to leave the sanctuary with him many a time as we worked on learning to go to church and worship God together. But the pay off? I pray I'm only seeing the beginning! "There is a big difference between worship B.C. and worship A.D. - worship "before children" and worship "after diapers"! I have heard more than a few parents confess, "I used to get more out of church before I had kids." Ouch! But it's true. And so I revert back to repeating to myself what my friend said to me four years ago: "This is special season of ministry." No, people will not always be in support of having children in the service. Admittedly, some who insist on having their children with them do a poor job of instructing them to both behave and engage with the congregation. That is where I think Parenting in the Pew comes in handy. It creates perspective, giving good, solid and practical advice. It instructs the parents to think about why it is that they have their children with them and how they need to go about accomplishing their goals as they have purposed to "parent in the pew." She argues for the practice of keeping the children in the service with the parents and she also encourages the parents to keep on keeping on! I really got a lot out of this book, encouragement-wise. It was a healthy reminder to both Jonathan and myself that we've made the right choice for our family and that this task is not insurmountable. In fact, having our children by our sides as we worship is a great blessing and one that we cherish. 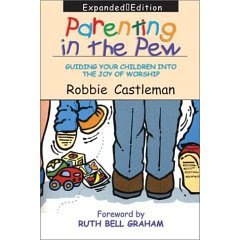 If you are wondering whether or not you should have your children next to you in the pew, and perhaps are not sure of how to go about that - I heartily and highly recommend Parenting in the Pew , by Robbie Castleman. She's straight forward, straight up and knows how to speak a kind word. Definitely a book I'm glad to have on hand and no doubt I'll be referencing it again as we start "fresh" with a new youngster and our Sunday mornings start to feel a bit chaotic again. But will the training be worth it? I must believe so, yes. I honestly wouldn't trade our Sunday morning "experiences" as a family for anything. We are all right where we need to be - learning to focus, not on ourselves, but on the most important thing of all - worshiping God. Hmm...I want to say a few things, but please know that though we choose differently, we still respect others, like you, who keep the children in the service. I do think the length of the worship service does impact how well the children do in a service. Our church is 1 1/2 hours, but if we are visiting family, that service is just an hour. Many, though not all, of the families in our church utilize the programs offered during the service time. A separate time is offered for Sunday school-with different teachers and lessons. We don't hear a ton of babies crying in the service, but it's not offensive when we do. We do like how this particular church ministers to the young children, esp that at age 4 they are worshiping with us, even though they don't hear the sermon. We have found that is also a good age for sitting still. Personally, when we have kept our little ones in the sanctuary with us (usually due to runny nose or something minor), it's not just that I didn't get to listen and worship...but it was incredibly hard for to give that time to God. However, I totally agree that it is a ministry...an important ministry teaching your children. I do suspect we'll be changing churches in the next few years (due to distance...it's 35-40 minutes away. we attended before we had moved). When we move, I don't think we will be looking for a children's program just like ours, but solid biblical teaching. Okay...I said plenty. I guess I just wanted to share why our church's children's ministry works for us, though we're not opposed to children with us in the pews. Though I don't have kids, I loved what you said in this post and nearly want to get the book and pack it away hope-chest style until I do have kids, which could be a while since I'm only 17. I'm living proof this way works. :) I always sat in church with my parents. After a move and a church switch, I tried out the children's church thing but, after coming to my parents with stories about what movie we had watched and how many Oreos I had eaten, they decided that sitting with them was the best option. My sister and I were the only children in the mid-size church that sat in the service, and my parents took a lot of heat for that. But, though I often remember boredom ensuing, I also remember watching my parents cry out to God during a song, "Amen"ing a particular part of the preacher's sermon, and lifting hands in adoration of Jesus. It was a time to see my parents a little vulnerable (something I didn't think was possible; they were rocks in my eyes) before God, to see them put their faith in action. So, besides the training in sitting still, just seeing my parents worship God had a huge impact on me. I'm very grateful for their decision, and I'm sure your kids will be too. Robbie Castleman teaches at my alma mater! The churches I grew up in didn't have Children's Church. I'll keep my personal stories to myself and just say that I agree with your take on children's church. We have separate Sunday School classes, which are segregated by age, which we also attend. I also liked this book and found it helpful, for the most part. However, I've seen cases (NOT in your post, just to make that clear) where people use this book or the idea that children should be in the service in a sort of "we're better Christians than you" way. I don't get that feeling from you or what you said at all but I think there are so many things in church that can become divisive as well as so many parenting decisions that are divisive that anything that combines parenting and church has the potential to be toxic. One thing I found helpful when reading this book is to realize that although she is very much a proponent of children being in the service and gives very helpful ways to help them learn how to be there, she did not have her kids sit through the sermon until older (I think age 5 if I remember correctly). I remember she said that they used it almost as a reward for the kids "when you're this age and big enough you GET to sit through the whole service". For us, we tend to have had our kids in the nursery until roughly 2 and then our church offers a "children's church" during the sermon only which is really just babysitting time for kids up to 5. We've found our kids vary as to what age we have them stop going to that and stay with us for the entire service. We have a long service (90+ minutes) which also might make our experience different. Anyway, great post about a touchy topic. I just wanted to point out that even the author didn't have all her kids stay with her in the entire service from birth on (which is the standard I've sometimes been made to feel that I need to live up to but fail at). I've also been at the opposite end of the spectrum and visited churches where we were made to feel very unwelcome if we had our kids stay with us. Bottom line, it's good for us all to give each other a lot of grace. So far, great discussion, ladies! Annette - I totally hear you. Alice - Yes! Yay! You got the tone of my post. We are totally NOT opposed to nursery and Sunday School programs. (Our church has one, although the Sunday School hour takes place before the main service so that people can attend both and yes, it's divided by age groups. We plan on making use of it after baby is here and we've adjusted -- and our kids are a little older.) I *think* most of the families in our church use the nursery until their kids are 2. We just choose to keep ours with us from the get-go. Which DOES mean a great deal of time exiting the sanctuary and bouncing babies in one's arm. It is admittedly exhausting. However, we think it works well for us in the long run. I can think of some specific people I know and specific situations where it really is much more useful to the family unit for the kids to be in a Sunday School program. I can't argue with their reasons. The only thing we ask in return is to be allowed to keep our kids with us - and we don't mind if that makes us different or stand out - we're doing what we believe is right for our family and we aren't demanding everyone else do the same. We're usually content to be the odd ones out. (Hello. jonathan and I were both home schooled when home schooling was definitely NOT the norm so we're used to people thinking we're kinda different.) Thankfully, most churches we have been at have been totally supportive of having kids in the service. A time or two we've been the only ones and it can be uncomfortable. Grace, as you said, Alice! SO important to extend grace in BOTH directions because it can be such a touchy subject. Obviously we've formed an opinion on what we think is in "the best interest of the child" ultimately. But I definitely think that there are some very valid exceptions and that some churches do a very good job with their Sunday School set-ups. I think people should distinguish between "teaching their children to sit through church" and "teaching them to worship God". I worked with a surprising number of people who were raised in strong Christian homes and were very knowledgeable about the Bible and Christianity but had no personal religious belief. I'm sure their parents THOUGHT they were teaching them to worship God but until the children grow up, it's hard to know what sticks. In our own church, roughly half of people's adult children attend church regularly and half don't. Our Bible classes are segregated by age, but our worship service, which follows the Bible class hour, is for everyone. We do have a cry room for babies that can be used by parents as needed, but not a different service for children in general. My children know how to sit still during worship (mostly) because that's all they have ever known, and they participate in the song service. My oldest also takes notes during the sermon. HOWEVER, I know we could do so much more to help our children develop a true desire for worshipping God, and this sounds like a book that would inspire and encourage us to do more. Thanks for sharing the review! Thanks for the post ... I will have to check out the book. At our church we have nursery available during the service (an infant room and a toddler room) and then children's church for 4-kindergarten after the offering. We kept our daughter with us during the services until she was about nine or ten months old (I can't remember exactly now). We try to keep her with us through the beginning worship. I'm glad that we have these opportunities and that our church really encourages worship as a family (5 and up are in the services). Thanks again for this topic and the conversation that it has sparked. Someone at co-op was reading this book a few weeks ago. We've really enjoyed our church's approach to children. We came from a church where the kids were kind of shoved off into a holding tank while the adults did their thing, but where we are now, the children are truly ministered to and regarded as valued members of the body. They don't have to stay in the service, but they are welcome -- there is even an insert in the pew offering parents some encouragement and instruction in how to have their kids with them in the service without stressing out. I'm pretty sure I've read this book! I just can't remember when. We also keep our kids with us. Our church is very small and has a kind of Sunday school combined with the nursery for 0-5 years. This is mainly because the previous pastor's family and my family were the only kids and we personally wanted our children to transition into the service with us at that age. At 3 yrs. children join their parents for the music, then at 5 yrs. they stay the whole time. Like you said, it takes training and parenting. At this stage it isn't "what will at 6 yr old get out of church." Instead it's about training the child to sit, pay attention and participate. You'd be amazed at the connections my 7 year old makes sometimes between what he hears at church on Sunday and things that come up throughout the week. Our current church strongly discourages it, I think, which is a bit harsh. In our last church, the kids were with us for praise and worship and prayer, and then had children's church. I liked that, but when Kyle left nursery age (at 4), and sat with us, I thought that there was NO way this active chatty boy was going to do it, but guess what -- he did. I loved singing praise with him and then hearing him hum those same songs around the house. I'm late here, but found this review very interesting. I've heard of the book, but not read it. We have, however, kept our children with us through church service through our 15 years of parenting and I just want to encourage you to "keep on keeping on". Your friend was right--it's a season which passes, and you are right--the payoff is *so* worth it. I think it would be interesting to read, and I appreciate what appears to be a "kind" tone in the book. It's great to stand up for what we believe in and do what we think is best for our family (even if it's different from what our brothers and sisters think is normal), but I think the most important ingredient is kindness--not superiority or judgment. Shonya - Amen to that!! I just added this to my Amazon wishlist. We keep Gideon in the service as much as possible. I take him out to feed and diaper him and when he just can't keep his cooing to himself. None of our friends here understand why we do it, even though we've explained over and over. And our friends who work the nursery feel like it's a personal insult to them. I wish this wasn't such a touchy subject.